Beachwood Canyon, built in 1984, is located in the coveted hip Beachwood Canyon area within walking distance to the Beachwood Market and Beachwood Cafe. You are in close proximity to walking trails, Beachwood Canyon dog park, horseback riding, Gelson's Market and the 101 Freeway. 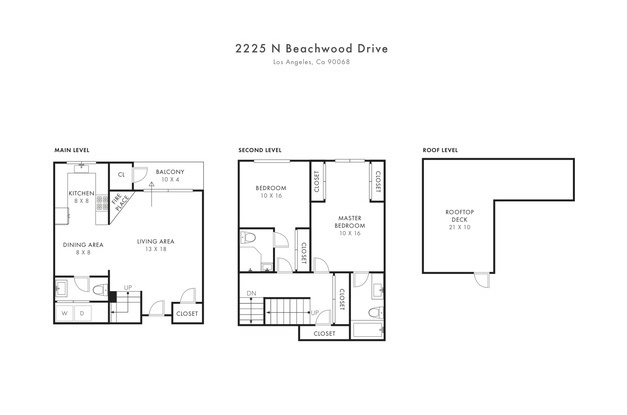 Beachwood Canyon Townhomes offers 12 units, each 3 levels, with two and three bedroom plans ranging from 800 square feet up to 1,400 square feet. They feature formal living and dining rooms with fireplace and wet bar, vaulted ceilings, skylights, clerestory windows and private rooftop decks with great views. The master suites boast two closets and private balcony. Most of the units have been upgraded in a variety of styles with finishes including hardwood floors, granite counters and travertine floors. Amenities include controlled access, a gym, sauna and secure parking.